Enemy activity had fallen into an eerie calm, but everyone felt the coming storm–a terrible storm, poised to unleash its fury upon the galaxy. It seemed as though the entire universe was holding its breath. Waiting. Whether waiting for the salvation of mankind or its demise was yet unclear. Along with his newly found, rag-tag band of alien friends, Nick Bannon battles to keep his devastating technology out of the hands of the biomechanoid race known as the Mok’tu. 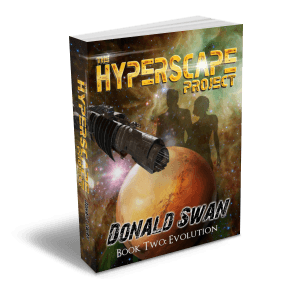 Nick is flung to a distant world when his hyperspace experiment goes awry. Now his peaceful experiment could become the horrific weapon of the malicious alien race. Every species in the galaxy is in danger of total annihilation and it may take one man’s greatest sacrifice to stop it. Unlock a special EXTRA chapter of the book! 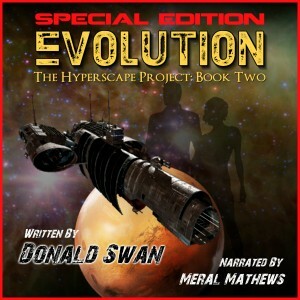 Use the clues in the book to unlock the combination code at TheHyperscapeProject.com and download The Lost Chapter! See the homage to George Takei (Star Trek’s Sulu.) from in the book, download sci-fi wallpapers, play The Lost Chapter game, and more at the author’s website. Karg woke to the sound of explosions rocking the ship. “Karg! Get to Bay One, we’re about to have company!” Arya’s voice demanded over his com-badge. Karg waited tensely through the long pause. Arya didn’t appear to be responding to the raider’s demands. “Let me talk to Arnon,” the voice demanded. On the bridge, Arya sat tall and straight in the Captain’s chair, glaring at the main view screen. An unkempt, scarred face stared back at her. Typical raider scum, in need of a good bath and some manners. At least over the vid-link she was spared from his stench. Arya’s mind raced. They knew about the module, but they thought it was still aboard the Ashok. How could she use that to her advantage? And Arnon? How did they know Arnon? The commander’s reply was long in coming. The smaller raider vessels zipped around the Ashok like betiks on a syrup tree, continuing to fly hit and run maneuvers. The constant plasma blasts were beginning to weaken the Ashok’s defenses. Sirok sent a message to Arya’s console with his wireless neural interface. The raiders had made it through the Ashok’s collapsing shields and had blown off the outer door to Bay One. With the shields failing and the hull breached, there was nothing to stop them from entering the ship. “Aye, Captain.” Sirok busily typed on his console. His holo-display showed a diagram of the ship alongside a roster of the crew and their current locations. Arya turned as she entered the transport tube. “Lock down the bridge.” The tube doors slid shut with a whoosh, and the tube sped down to the bay level. Sirok broadcasted a message to all hands, ordering them to defend the hangar bay. The bridge grew quiet. The bombardment had ceased. The raiders were now focused on taking the ship. Sirok put a priority-one lockdown in place, sealing off the bridge. Arya would be able to command the ship through her encrypted mobile data unit, but if all else failed, Sirok would have to take over command from the bridge. The protective mucus covering Sirok’s body oozed faster. It was a natural bodily function for a Kymirian under stress, a vestige of his ancestry that allowed them to move quickly and replace the antibacterial covering at a more rapid rate. His nerves were beginning to get the best of him, and he could feel it in the thinning mucus running down his face. He knew that even with the bridge locked out the raiders could disable the engines and other systems if they infiltrated the ship. Arya slid to a stop next to Karg in Bay One. The force field in the bay was holding, but through the translucent wall of static, the ominous presence of the raiders was apparent. A boarding party was nearing the field, spreading into several groups. “Yes, Sir!” the crew replied in true military fashion. In front of them, the glove of an armored space suit pierced through the force field. Another hand came through the force field, a pistol aimed and at the ready. Plasma blasts ricocheted off the metal crate in front of them as they ducked. “Open fire!” Arya commanded, as she popped up and fired several rounds at the raiders. A barrage of plasma bolts streaked back and forth across the bay. Puffs of smoke rose from the impacting balls of plasma, creating an early morning fog-like haze throughout the bay.